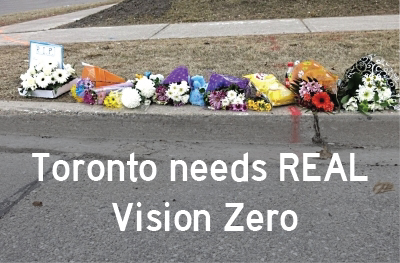 Vision Zero is all about safe systems. This means minimizing conflict in our mobility systems by setting safe speed limits; by regulating motor vehicles; and by implementing failsafe infrastructure. Scroll down for video introductions, and for a list of safety tips from Canada’s leading Vision Zero expert. Here’s an overview of Vision Zero thinking, courtesy of the road safety division of Tasmania’s Transport Department. Share this video via Twitter. And below you’ll find a terrific introduction to the sustainable safety approach in the Netherlands. Made to accompany a presentation (available here in PDF form) to Boston City Council, it’s written and narrated by US Professor Peter Furth, with filming and editing by Mark ‘Bicycle Dutch’ Wagenbuur. Furth coins the term ‘systematic safety’ which recalls the widely-used ‘safe systems.’ The first minute of the video is devoted to footage of typical North American streets, designed for maximum throughput of motor vehicles and high levels of traffic violence. The remaining seven minutes show Dutch roads, optimized for the efficient flow and safety of drivers, cyclists and pedestrians. Since the conflict is designed out, it’s no wonder that the Netherlands enjoys the world’s highest level of driver satisfaction. The following tips are courtesy of Neil Arason, who wrote the book on traffic safety in Canada. Make road safety a top priority in Canada and create a federal multi-disciplinary public safety agency charged with significantly reducing motor vehicle-related fatalities and serious injuries year-over-year, and then eliminating them by 2035. Require that every motor vehicle sold in Canada by 2020 and later will not kill or seriously injure any road user, not even a pedestrian or cyclist. To bolster these benefits, ensure vehicle regulation applies to more cars entering Canada (i.e., upgrade the flawed federal 15-year importation rule to 25 years); require automakers to track deaths and injuries from their motor products; and create programs and incentives to ensure vehicles are maintained or removed from the road when necessary. Pass federal legislation to earmark a set percentage of highway funding for pedestrian and cyclist infrastructure. This would be similar to what Oregon did in 1971, and what former US laws like the Safe, Accountable, Flexible, and Efficient Transportation Equity (SAFETEA) accomplished. Use these new funds to build sidewalks; install pedestrian traffic islands; construct better crosswalks (e.g., the Hawk design and Danish Offset); and add countless new kilometres of protected and connected bicycle lanes. Expand measures to separate pedestrians and cyclists temporally from motor vehicle traffic. At busy intersections, bring back the pedestrian scramble or implement leading pedestrian intervals that provide a three to six second exclusive advance WALK signal to pedestrians. For cyclists, create dedicated bicycle signal phases at intersections and build more bicycle boxes to improve their visibility to others. Ban the right-turn-on red. 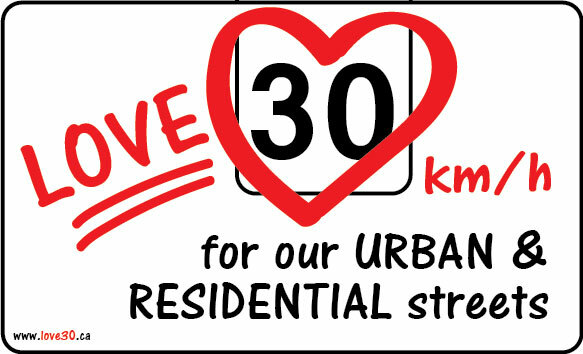 Set speed limits to 30 km/h in places where pedestrians and cyclists mix with cars. Design urban roads in ways that reduce speeds and implement more traffic calming measures. Separate opposite-flow traffic on high speed arteries with medians, cable barriers or concrete barriers. Install crash attenuators and ensure that speeds are set under safe system design principles in order that crashes can occur in modern cars without causing death or serious injury to vehicle occupants. Expand the number of roundabouts and ensure they are easy to use and designed for the optimal safety of pedestrians and cyclists. At the same time, roundabouts reduce speeds, eliminate dangerous right-angle crashes, and increase driver alertness. Invest in low-cost roadway design measures like rumble strips; channelized traffic movements; better lane markings; anti-skid pavement resurfacing; and improved signage. Make driving as simple as possible to align with the real-world imperfections of drivers and what we have come to know about them for the past one hundred years. Help drivers obey the everyday rules of the road by using modern enforcement technologies like automated speed cameras and red-light cameras. Couple this with dedicated traffic enforcement units to target impaired and unsafe drivers. Here’s a graphic from Brian Bethune’s Maclean’s article profiling Arason’s crucial No Accident book (Waterloo, Ont. : Wilfrid Laurier UP, 2014). Click image to share on Twitter. For an intro to fact-based #roadsafety policy look no further than @neilarason's feature in in the latest issue of @itecanada Transportation Talk.